Disclosure: We may receive a commission for links on our blog. You don’t have to use our links, but we’re very appreciative when you do. Thanks again for your support; we hope you find our articles and information helpful! Why Are There so Many Foreigners in San Miguel de Allende? Is San Miguel de Allende, Mexico Safe? Many consider San Miguel de Allende, Guanajuato the colonial heart of Mexico because of its Spanish Colonial charm and beauty. However, even with such a rich history San Miguel de Allende is also a destination for artists, tourists, and expat retirees. Furthermore, the history of the city is the reason for its UNESCO World Heritage Site listing and why in 1926 the town was declared a National Monument by the Mexican Government. The Spanish settled San Miguel de Allende in 1555, and in large part because of the construction restrictions and the restoration and conservation efforts, to this day the architecture and layout of the Spanish is preserved in the historic center. Additionally, in the 19th century, the city played a large role in the Mexican War of Independence, and it was during that time, that it earned its current name of San Miguel de Allende from Ignacio Allende, a leader in the movement for freedom from Spanish rule. San Miguel de Allende, Mexico is a beautiful Spanish Colonial town with a history that played a large role in the Mexican War of Independence. If you’re anything like us, you may find yourself walking the streets of San Miguel de Allende and wondering why you seem to pass almost as many Mexicans as you do foreigners. We wondered if this was a recent occurrence, or if it had been a destination for retiring foreigners for a while. To shed some light on the topic, we learned that in fact, San Miguel de Allende has been a favored destination for expats for some time. Starting in the 1950s, between the end of World War II, the polio scare in the United States, and the beginning of artist colonies and the now famous art institute, Instituto Allende, expats found San Miguel de Allende to be a welcoming destination. So much so, that the city now regularly finds itself on the top of lists of best worldwide destinations! San Miguel de Allende, Mexico is a beautiful city, so it's no surprise why it's become a popular place for tourists and expats alike. If you’re wondering if San Miguel de Allende is safe to visit, you’re probably not alone. In the United States, Mexico receives its fair share of media mentions, whether it be in reference to geopolitical matters, tourist safety, spring break appeal, or exotic getaways and cruises. Therefore it’s no surprise that opinions on one's safety while visiting Mexico vary. So, when we were graciously offered a house sit in San Miguel de Allende, we took it upon ourselves to investigate the overall safety of traveling to Mexico, as well as specifically to San Miguel de Allende. When looking into travel warnings and advisories, a good resource is the US Department of State, which we also used before we considered travelling to Istanbul and Cairo. What we found is that out of the 31 Mexican states, only five had strict ‘Do Not Travel’ warnings (Colima, Guerrero, Michoacán, Sinaloa, and Tamaulipa). After reading the ‘Do Not Travel’ warnings and parsing information from various sources, we concluded that our visit to San Miguel de Allende, Guanajuato would be safe. Visit the US Department of State website for a map and detailed travel warnings and safety information. Looking back, our experience was a positive one, as we never felt even remotely unsafe in San Miguel de Allende. We traveled on public buses, walked throughout the city in both tourist and non-tourist areas, and met many locals. Of course, we took the precautions that we take anywhere (even in the United States) to keep our belongings and ourselves safer. We honestly felt just as safe in San Miguel de Allende as we've across Europe and in the US. If you’re still unsure about traveling to Mexico, we understand your hesitation. However, we’d argue that due to a large expat community, San Miguel de Allende is a great place to start your travels within Mexico. It offers the experience of a beautiful Spanish Colonial town, while still having many American (or perhaps Western) amenities and influences. From there, you may find yourself craving to explore many more parts of this large, diverse, and beautiful country called Mexico! Naturally, whichever airport you fly into, you’ll still be tasked with actually making your way to the city of San Miguel de Allende. You can rent a car, schedule a shuttle, hail a taxi, or take an Uber (use our link and get your first ride free!). However, we highly recommend the adventure of taking an interstate bus! If you’ve been following along our adventures, you’ll know that we’re big proponents of using public transportation to experience life as a local and to get to know a city beyond most tourists' perspective. As intimidating as you might find it (or not for the adventurous at heart), it’s well worth the experience! Forgoing a car and instead opting for a bus is easy. Buses run to and from San Miguel de Allende to Mexico City, Santiago de Queretaro, and Leon, making it a very viable option and an inexpensive one too! There are several bus companies that operate the route (Primera Plus, ETN, Flecha Amarilla, Omnibus). You can purchase online ahead of time, from the bus terminal ticket counter, or on the bus from the driver or ticket attendant. Tip: If you’re arriving at the airport in Mexico City (MEX), buses leave from Terminal Norte Depot, which is next to the Autobuses del Norte on the metro yellow line. In our case, since our latest adventure awaited us in Santiago de Queretaro, we chose to fly into Queretaro Airport (where we did 41 days of free Hilton lodging on the 'Ultimate Mattress Run'!) and take a bus to San Miguel de Allende, Mexico. We purchased our round-trip bus tickets several days in advance, so they were 'open tickets', meaning we could board any day and anytime in the upcoming six months. We purchased round-trip bus tickets to San Miguel de Allende, Mexico from Santiago de Queretaro in advance. However, if you choose, you can purchase them at the time of your travel at the bus terminal ticket counters or when boarding the bus (far right image is of the ticketing agent on-board the bus). Buses from Santiago de Queretaro, Mexico bound for San Miguel de Allende left every forty minutes throughout the majority of the day. Keep in mind, since many of the buses don’t originate in Queretaro, traffic affects the schedule of bus arrivals and departures, particularly when they’re coming from Mexico City. Tip: Remember, when purchasing bus tickets in advance you’ll be given an open ended voucher valid for six months. Therefore, on the day you intend to travel to San Miguel de Allende give yourself extra time as you’ll still need to approach the ticket counter and convert your open ended voucher into a valid ticket intended for a specific two hour window. The Santiago de Queretaro, Meixco bus terminal is near the stadium (Estadio Corregidora) and is a busy transportation hub. We found the bus to be comfortable. It had overhead space to place our backpacks and a movie playing (in Spanish of course) to keep us entertained, although we both opted to put in our headphones, listen to podcasts, and enjoy the passing sights. Before we knew it, the bus was at the main terminal station in San Miguel de Allende, which was only a short walk to city center. Tip: The bus route makes many stops along the way, including several throughout the city of San Miguel de Allende, Mexico. If you choose, you can disembark before the main terminal station. The San Miguel de Allende, Mexico bus terminal is located within a moderate walking distance from city center ('centro'). If you choose to take a taxi from Leon Airport (BJX), we recommend only taking the official green and white taxis. Or, if you're traveling from Santiago de Queretaro Aiport (QRO) take one of the yellow taxis. Whichever airport you choose to travel from, do yourself a favor and know the typical taxi fare price range ahead of time by using TaxiFinder. Finally, before entering the taxi, verify or agree on a price with the driver before commencing your trip. Alternatively, consider calling your hotel and asking if they offer or can recommend a shuttle service. Uber (use our link and get your first ride free!) is available in San Miguel de Allende, as well as Leon, Santiago de Queretaro, and Mexico City. Unfortunately, at the time of our visit Lyft wasn’t yet available in San Miguel de Allende. Traditional homes in San Miguel de Allende, and most of Mexico for that matter, remind us very much of traditional Riads in Morocco. The fronts of traditional Mexican homes are designed more for security and utility, and much less for aesthetics. However, if you go beyond the plain and closed off exteriors you’ll almost certainly enter into a beautiful courtyard that’s likely draped with hanging tropical plants, flowers, and wonderful shading trees. The u-shape of the home means that most rooms share the beautiful views of the courtyard and make it a great place for relaxing with friends and family. Moreover, many homes have fantastic roof top terraces and if the home is on one of the many mountain inclines in San Miguel de Allende, the views of downtown are gorgeous! In Mexican tradition the homes of San Miguel de Allende are built with wonderful center courtyards and rooftop terraces! We were fortunate to have a house sit in San Miguel de Allende that was in a traditional style home, although split into several apartments. It was as if we were living in a neighborhood within a neighborhood, or as they’re known in Mexico: vecindades. Be sure to check out the options for house sitting in San Miguel de Allende, as we’ve regularly seen listings posted! When you're looking for a hotel in San Miguel de Allende, for a fully immersive experience we’d highly recommend an Airbnb (use our link and save up to $40 off your first stay!) or hotel that has a view, roof-top terrace, and a traditional central courtyard. Hotel options range from hostels to luxury, so you’re sure to find something in your price range. We were fortunate to house sit in San Miguel de Allende and care for Jack and Dave! Plus, the kitchen was tiled with bright traditional Mexican tiles. Pack good walking shoes (we love our Altras!). Since the city was made a National Monument in 1926, construction became restricted in the historic center of town, meaning that most of the streets have remained cobblestone streets. They definitely add to the charm and historic feeling of the city. However, while they’re no doubt quaint, walking on them can be a bit more challenging. Think uneven walking paths that leave you with sore feet at best and twisted ankles at worst. There are of course sidewalks, but again, because of restricted construction and perhaps other factors, they’re not always in the best shape. Cobblestone streets add a ton of charm to San Miguel de Allende, Mexico, but they do require a steady balance and comfortable shoes! San Miguel de Allende Look Outs "Miradores"
The historic “Centro” of San Miguel de Allende is relatively flat and level, however if you plan to visit the outlooks (‘Miradores’), you’ll find yourself walking up hill. If you’re up for it, the Spanish Colonial Streets are well worth the hike, but if you prefer, find a green and white taxi or Uber to drive you up the hill to the Miradores. San Miguel de Allende's well known El Mirador is a great spot to see the beautiful views of the Spanish Colonial town. We arrived just after sunrise and were nearly the only people there! San Miguel de Allende's Mirador Cruz del Pueblo may be a hike to reach, but the view is worth it! Taxis in San Miguel de Allende are easy to find, in fact they’re usually driving up and down the main roads looking for ‘fares’. Look for the green and white cars and be sure to settle on a price before accepting the ride. Additionally, try negotiating a lower price, since it’s not uncommon for the first quote you’ll get to come with an additional tourist ‘tax’, inflating the total price. It's best to avoid drinking the tap water in San Miguel de Allende, Mexico. Only drink bottled water, it’s inexpensive and readily available in grocery stores. Alternatively, a great way to get clean water without spending money on bottled water (and reducing the use of bottles) is the SteriPEN or LifeStraw. Make sure the water bottles is sealed when you get it. Sadly, it’s possible that to save money the water bottle could have been refilled with tap water. Don’t eat fresh vegetables and fruits unless they’ve been washed with Microdyn or something similar, since they’ve probably been washed with tap water along the way. It’s okay to eat cooked vegetables, as well as fruit that you eat by peeling and discarding the skin. Additionally, find out if what you're eating is safe by downloading the CDC's 'Can I Eat This?' app for your mobile device. The CDC also has an app that, based on your specific destination, will give you a list of vaccination recommendations. It has calendar reminders for vaccine booster shots, travel packing lists, and can store important medical and immunization records. Keep your mouth closed when swimming in open bodies of water and in the shower. Brush your teeth and take your medications with bottled water. Order your drinks without ice. Prices for goods and food will be higher in the historic center of town, so head away from the tourist areas to get the ‘local’ price on food and goods. Keep in mind, that while there’s exceptions to the rule, if you enter a restaurant that has more locals in it than tourists, you’re in the right place! There's delicious food to try in San Miguel de Allende, Mexico. Don't miss the street food, restaurants, and roof-top terraces! We found locals to be extremely kind and helpful, especially when greeting them in their own language. Learning a few phrases will go a long way! ¿Perdón, habla usted Ingles? – Excuse me, do you speak English? If you’re staying near city center, consider packing ear plugs. It’s quite common to hear a steady stream of barking dogs and fireworks at all hours of the night. Vehicular traffic in the center of town can be quite congested, and at times, the roads may be converted to pedestrian only. If you’re unfortunate enough to find yourself in this situation, the best thing you can do is to find the nearest parking place (or leave the area) and transition to walking. Mexican architecture is unique in that the fronts of homes are designed for security and utility and are rarely designed to have a front lawn. Therefore, while most residential streets in Mexico appear ‘plain’ and possibly even ‘un-inviting’ by American architectural norms, San Miguel de Allende, Mexico offers a wonderful addition for visitors: look closely and you’ll find wonderful doors and unique doorknobs and doorknockers. We found everything from life-like hands to frogs and fish! The doors and doorknockers in San Miguel de Allende, Mexico are intricate, creative, and unique! If you’re a fan of street art and murals, be sure to check out Colonia Guadalupe (Guadalupe neighborhood). It’s an area of San Miguel de Allende, Mexico where street art is allowed, and so it’s grown into a very beautiful and colorful neighborhood! If you’re like us, we enjoy sugar-free flavored gelatin as a snack in warmer weather. A bit watered down and frozen, it makes for a delicious popsicle or shaved ice! We found many new and unique flavors like pineapple, mandarin, jamaica, grapefruit, and green apple at La Comer (a large grocery store) in San Miguel de Allende! We're known to enjoy sugar-free Jello (gelatin) on occasion and were excited to try the new (to us) flavors we found in Mexico. Be cautious if you aren’t used to or don’t like spicy food. It’s common for many types of food to be spicy in Mexico. Even the orange slice samples we saw in the grocery store were covered with a sprinkle of chili powder. So, if you see something with red powder on it, expect it to be spicy. In addition, if it’s something you already expect to be spicy, just assume it’s probably a notch or two spicier than in you're used to! 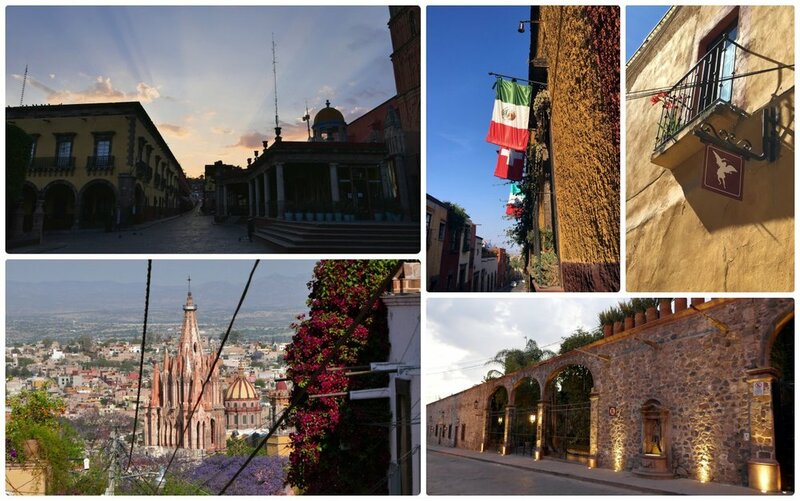 San Miguel de Allende is a beautiful, historical, and charming town that attracts visitors from all over the world. Whether you’re artistic, enjoy history, love charming towns, or simply want to experience Mexican culture, then San Miguel de Allende will surely have something to make your trip to Mexico memorable and enjoyable!